If anda got offered a spot to vist a host would it be Kyoya? If Kyoya proposed to anda would anda marry him? Who's lebih of a "king" in the host club? pilihan fans: Kyoya! Of course! I entered Ouran Academy and looked around for my cousin Haruhi. she was nowhere in site! I entered the host club and saw the others chatting.Hey.....Itsumi! Tamaki shouted. Tamaki-kun! I berkata hugging him.What are anda looking for?!?! He asked looking in my eyes.Haruhi! Thats what! Why? cuz i need to tell her something important.I think she's in the classroom...Kyoya said.Thanks! i berkata and ran out. anda know what I hate? I hate it when fan make yoai pairings in anime with charecters that are obviously straight. So when I was on photobucket and saw a VERY graphic yoai pic of Tamaki and Kyoya-sama, I was so ticked I wanted to scream. 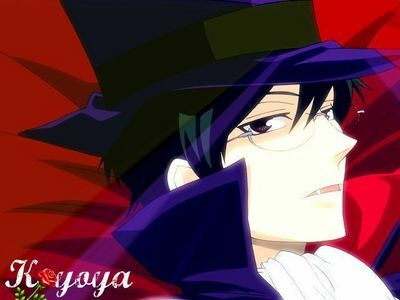 Dear Diary::Kyoya Ootori...that rich jerk! Everytime I do something he completely destroys it!Like in class I raised my hand and got a pertanyaan wrong "Oh well" anda may think but not for Mr Ootori. He wormed out the answer like a venomous ular berbisa, viper and stared at me all lesson! I know he is just cruel to me because Haruhi in 'Host Club' is a 'commoner' as well! That jerk needs to learn respect... even commoners have brains kyoya! a poll telah ditambahkan: who should Kyoya go out with? Do anda think Kyoya-sama and Haruhi would make a good couple?